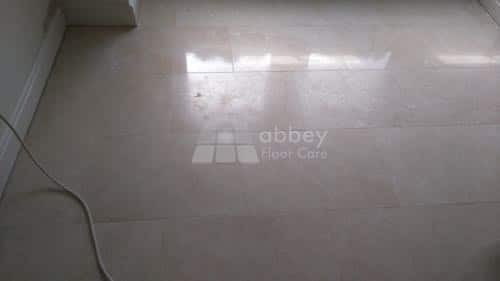 Dull marble tiles can be really frustrating; soil gets trapped in the scratches, no amount of mopping gets them clean and it looks as though you are neglecting your floor. 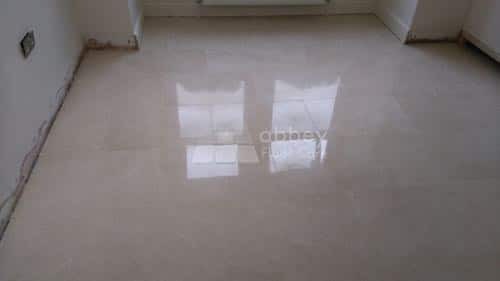 This marble polishing Tooting project in South London WS17 was no exception and our customer was desperate to bring the shine back to her floor. 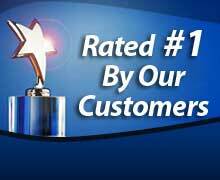 In this situation, our customer had a few marble restoration issues to solve. 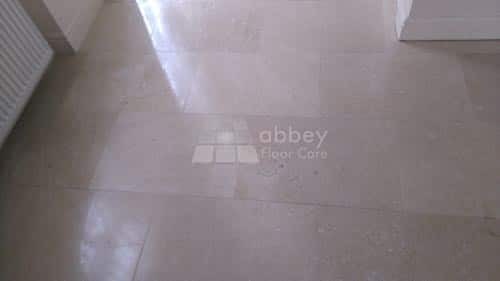 there where quite a lot of dull etch marks that customer was becoming increasingly frustrated with because they were very visible compared to the shine on the surrounding stone. the grout lines were soiled and the customer had damaged the finish on the tiles where they had cleaned the grout. This picture shows part of the dining area next to patio doors. You can see how the marble is dull and in need of cleaning and polishing. The tiles had been laid quite well but there was lippage up to 2mm in places. 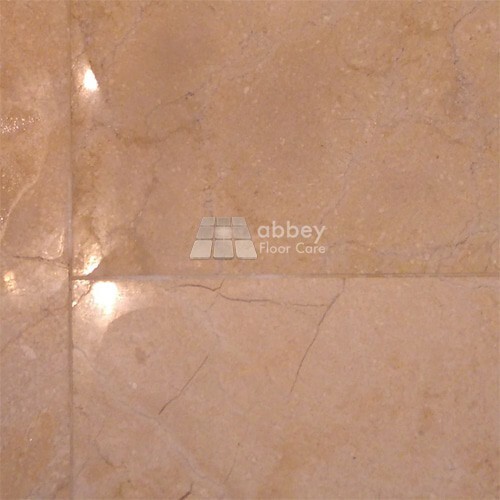 This image demonstrates the problems that can happen with uneven marble tiles or lippage. 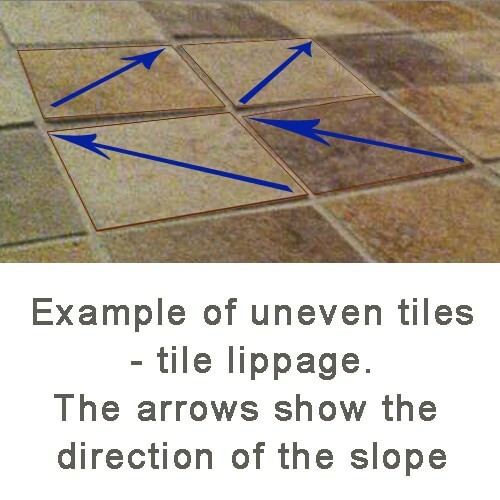 The arrows show that 4 adjoining tiles are all sloping in different directions. This means that where a tile is say 2mm high in one plane, it is also 2mm at the other end – the difference of 4mm needs to be ground away. 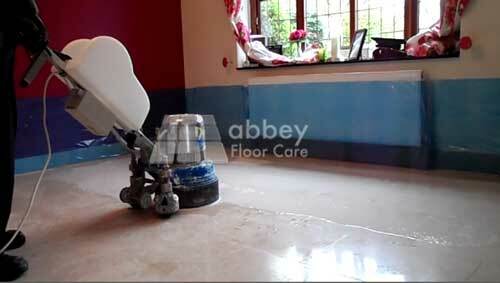 If an adjoining tile slopes 1mm lower than the adjoining tile, then 5mm has to be ground away to make a floor smooth. 1. Machine grind the floor and hand grind the edges to remove all lippage and create a monolithic floor, then hone and polish. 2. Do not grind, but rely on aggressive honing to remove scratches and light lippage up to around 1mm and smooth the edges of deeper lippage and then re-polish. In this situation, the client decided against grinding as there were a number of small rooms and the amount of edge grinding brought the cost outside of the client’s budget. We first applied protective tape to the skirting boards. 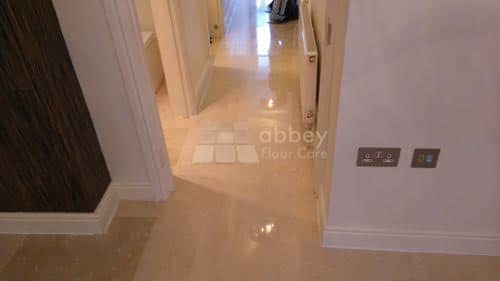 We started by honing the floor starting with 50 grit resin bond diamond disks, then 120 grit, 200 grit, 400 grit and 800 grit disks. This kind of honing disk contains the diamonds within the resin and new diamonds are gradually exposed as the resin wears. If you would like more information about this Marble Polishing Tooting project, get in touch now. The honing disks were placed on a flexible carrier plate so they could follow the contours of the floor without chipping the edges of the individual marble tiles. This creates an even smooth finish. They removed around 1 mm of stone. As the floor was not initially ground smooth, there were some areas of “picture framing” where the edges of some tiles were too low to be honed. The image above demonstrates how the edges of the 4 tiles are too low for even a flexible honing pad. So we used an 800 grit honing powder with a rotating brush head to create an even finish. If these areas were not powder honed they would show up because they the finish was created by a different process. The floor was then honed twice more with 1,500 grit and 3,000 grit resin bond diamond disks. This created a high sheen finish ready for final powder polishing. Once the floor had been powder polished it has a beautiful deep gloss finish. We then applied two coats of penetrating impregnating sealer to help protect the finish from spots and spills. As you can see the floor now looks clean and beautiful.